DESCRIPTION: New in 2013, Rising Sun is a 5400 square foot ocean front home with 330 feet of private frontage. Situated on a very private 3 acre lot, this property is perfect for that Maine vacation! 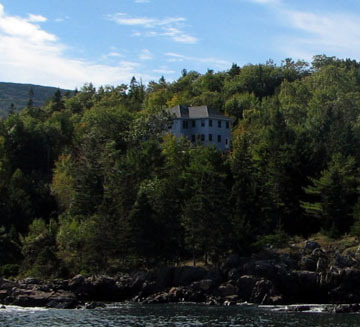 Shopping and dining are all nearby in town Bar Harbor as well as access to the free Island Explorer for a day of exploring throughout Acadia National Park. This property is also very pet friendly and includes a dog room, dog beds, bowls and protective blankets for the furniture. LAYOUT: GROUND FLOOR: Family room. Yoga/bedroom with a queen bed. Gym/bedroom with a queen bed. 3/4 bath with shower. FIRST LEVEL: Fully equipped professional kitchen, pantry, living room/dining room, powder room. 1st floor master bedroom with a king bed and 3/4 bath with shower. SECOND LEVEL: 2nd floor master bedroom with a king bed, whirlpool tub and shower room. Bedroom with a queen bed, shared bath. Bedroom with 3 single beds, shared bath.